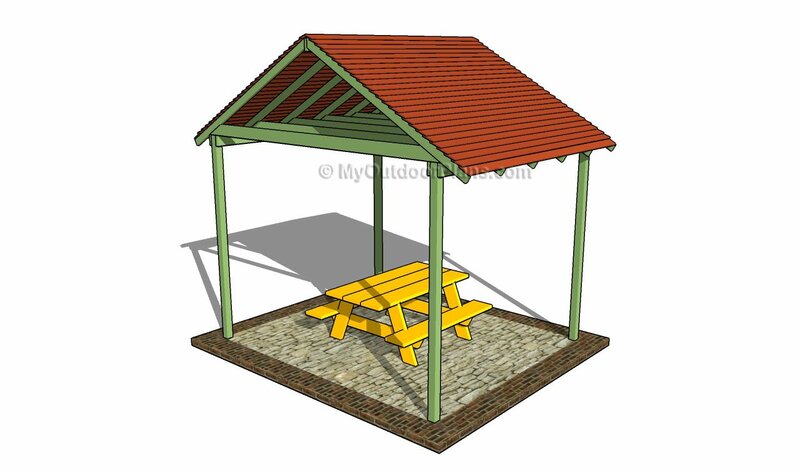 This step by step diy project is about how to build a picnic shelter. 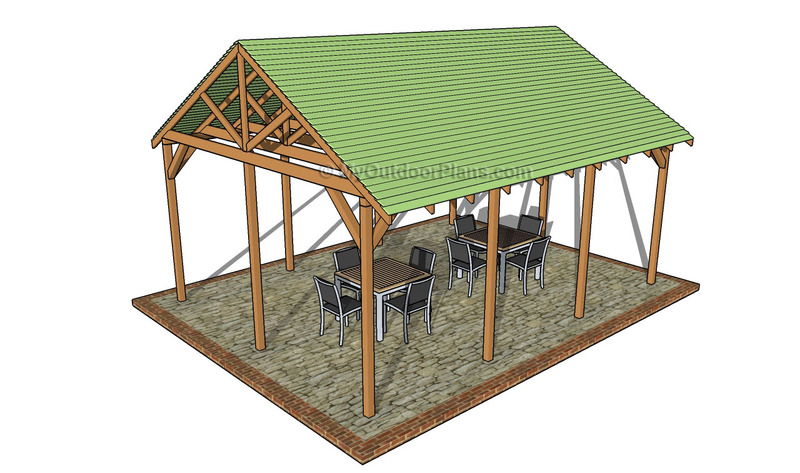 If you enjoy spending time in your garden, we strongly recommend you to consider building a picnic shelter. There are many plans and designs to choose from, so don’t forget to take a look over several alternatives before starting the actual construction of the woodworking project. In most cases the structure requires a building permit, so read the local building codes. 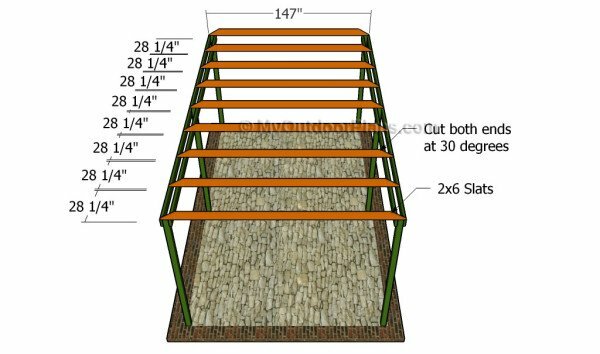 The first step of the woodworking project is to lay out the picnic shelter in a professional manner. 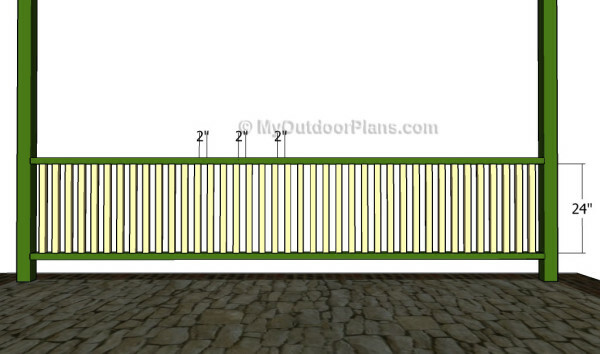 As you can easily notice in the plans, we recommend you to build the posts out of 4×4 lumber. 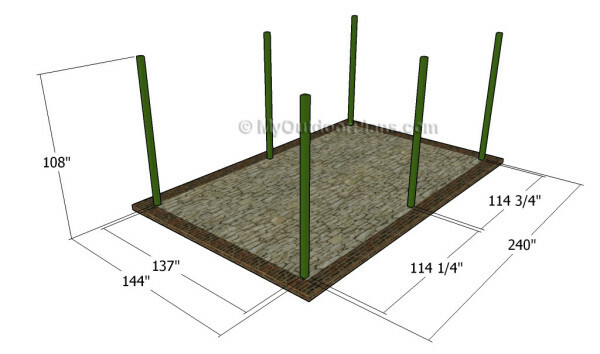 Use batter boards and strings to lay out the posts in a professional manner. Top Tip: Apply the 3-4-5 rule to every corners of the structure, otherwise the corners won’t be right-angled. The next step of the project is to set the wooden posts into place. 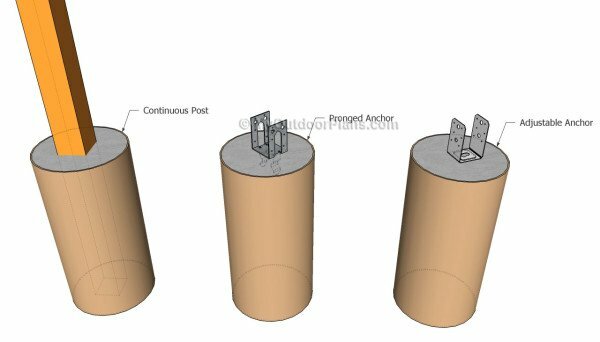 Therefore, you can choose from several options: setting the posts into concrete or using post anchors. In the first case, you need to 3′ deep holes and fit tube forms. Set the posts into place, plumb them and secure them temporarily with braces. Top Tip: Fill the tube forms with concrete and let it dry out. In the second case, fit the anchors into concrete and fit the posts with spirit level. 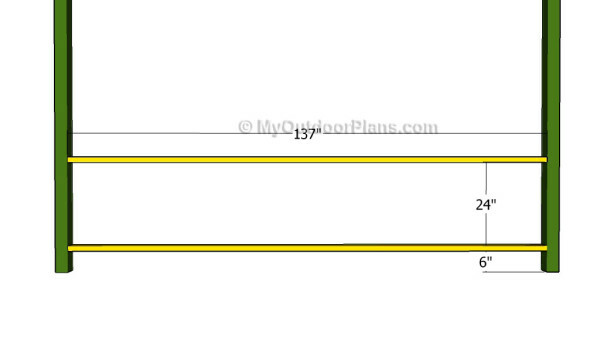 Check out the local building codes, so you find out the right depth for your footings. The next step of the woodworking project is to attach the 2×6 support beams to the top of the posts. Use a spirit level to make sure the beams are horizontal and clamp them to the posts tightly. Drill pilot holes through the beams and through the posts. Then, insert 7″ carriage bolts and leave no gaps between the components. 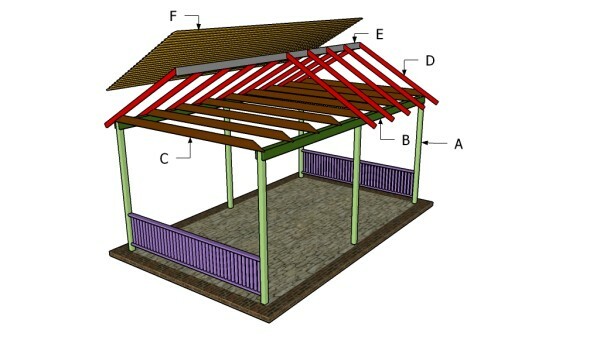 Building the roof of the picnic shelter is a straight-forward process, but you need to pay attention to several aspects, in order to prevent the wood from splitting. 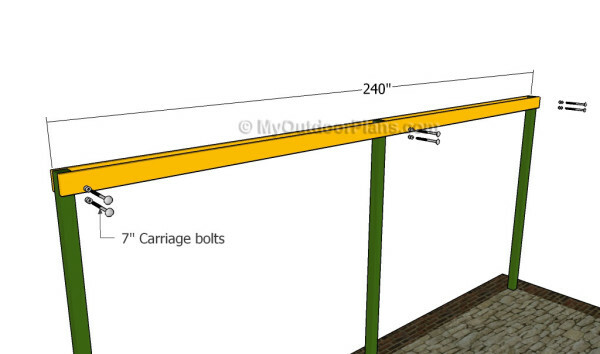 Cut the bottom rafters out of 2×6 lumber, making sure you cut both ends at 30 degrees. Place the bottom rafters equally-spaced, drill pilot holes and secure them to the support beams with 2 1/2″ galvanized screws. Make sure the beams are plumb and leave no gaps between the components. 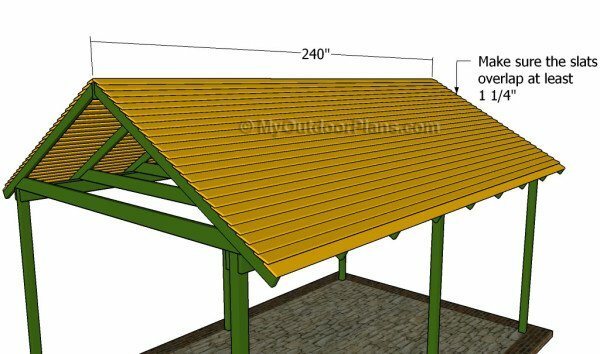 Next, you need to build the top ridge out of 2×6 lumber and the rafters out of 2×4 lumber. Cut the components at the right size and cut one end of the regular rafters at 60 degrees. Attach the rafters to the top ridge and to the bottom rafters, at the other end. Drill pilot holes through the rafters and secure the structure using 5″ galvanized screws. 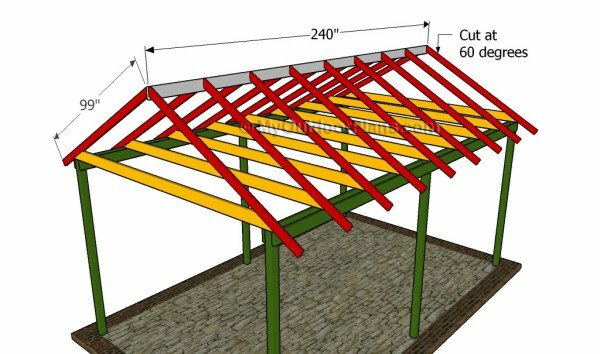 Place the rafters equally-spaced and make sure the joints are rigid. 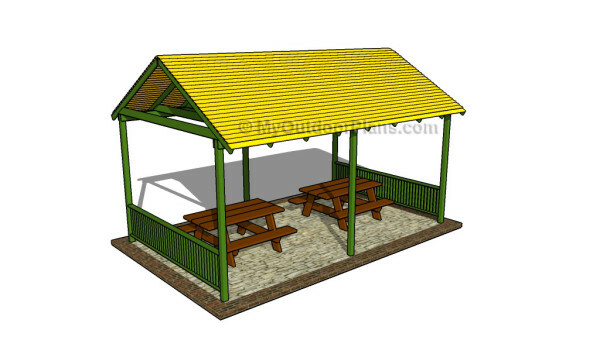 If you want to enhance the look of the picnic shelter, we strongly recommend you to build railings on the faces of the structure. In order to get the job done in a professional manner, we recommend you to attach the top and the bottom rails to the legs. Drill pocket holes at both ends of the components and secure them to the legs using 2 1/2″ screws. Make sure the corners are right angled and leave no gaps between the components. Continue the woodworking project by a attaching the 2×2 balusters to the top and bottom rails. Cut the balusters at the right size and drill pocket holes at both ends of the components. Fit the balusters into place and place them equally-spaced. This woodworking project was about how to build a picnic shelter. If you want to see more outdoor plans, we recommend you to check out the rest of our step by step projects.